At the trail’s end, Upper Melakwa Lake laps the stony skirts of Kaleetan Peak (left) and Chair Peak (right), joined atop their zigzagging cleft by Melakwa Pass. Denny Creek – Melakwa Lake Trail, July 02, 2017. The rugged trail to the lakes Melakwa generally follows Denny Creek through pleasant, mostly coniferous forest, past waterfalls, along a canyon rim, and across sprawling boulderfields that are the surrounding peaks’ winter avalanche chutes, finally ending at a pair of sparkling lakes nestled high in an alpine cradle. Here and there, wildflowers dot the stone-strewn trailside and flourish in mid-summer swaths along the lakeshores. The rocky trail gradually climbs the creek valley before steeply ascending Hemlock Pass at its head and then generally descending the ridge’s undulating flank to the lakes just beyond. Near the lakes, those wishing to venture still further can pick up connecting trails to Melakwa Pass, Lower Tuscohatchie Lake, and Pratt Lake. For most of its distance, the trail traces Denny Creek to its headwaters at Hemlock Pass. Denny Creek – Melakwa Lake Trail, July 02, 2017. The trail begins In boggy lowland forest, where giant conifers stand like gateposts. Denny Creek – Melakwa Lake Trail, July 21, 2013. 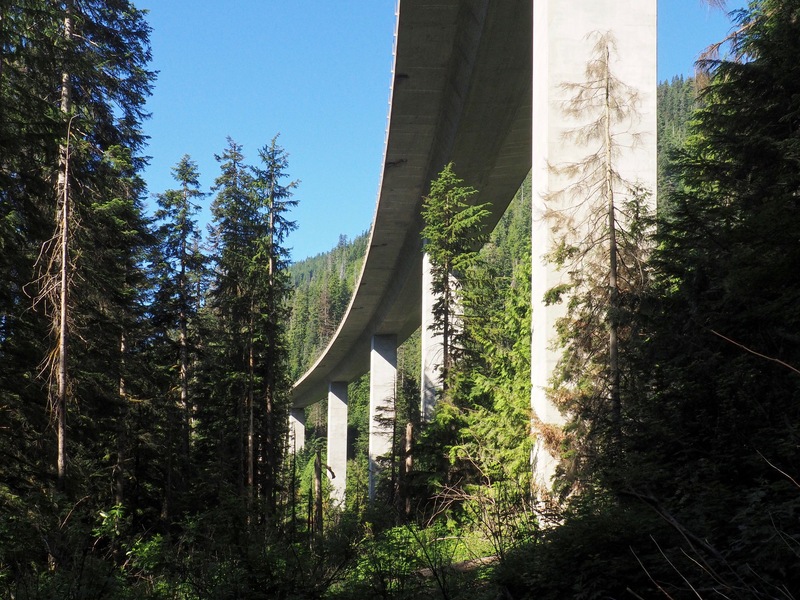 Not far from the trailhead, the Interstate 90 viaduct soars unexpectedly overhead. Not to worry – its roar is soon drowned by Denny Creek’s cheery babble and dies out altogether after approximately two miles/3.20 km. Denny Creek – Melakwa Lake Trail, July 02, 2017. 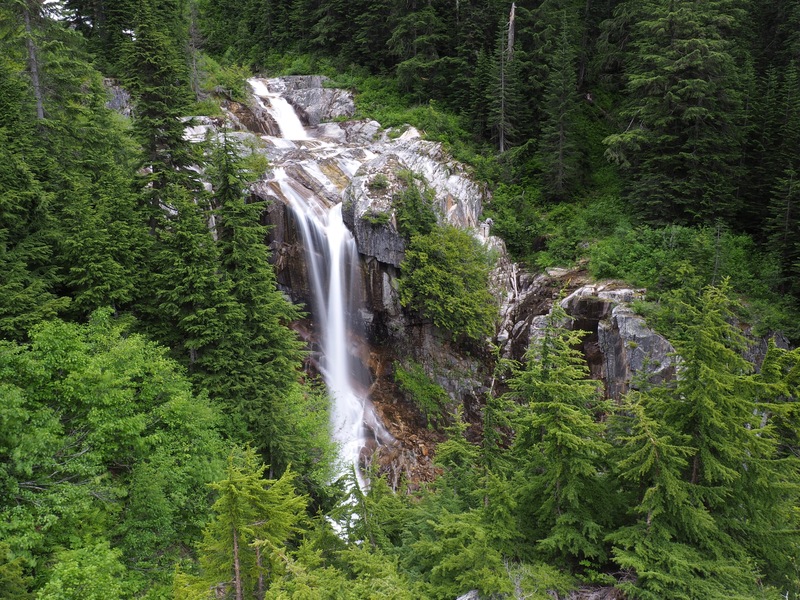 At approximately 1.25 miles/2.00 km, the trail reaches Denny Creek’s Slippery Slab, a smooth expanse of rock edged by a series of pools and small waterfalls that is popular with parents and small children as a natural water park. In winter and spring, higher water volume and a glaze of ice can render the creek crossing treacherous. Denny Creek – Melakwa Lake Trail, August 03, 2014. Denny Mountain, here blazoned with evening’s last golden swath, flanks the trail’s lower, open stretches. Denny Creek – Melakwa Lake Trail, September 02, 2013. 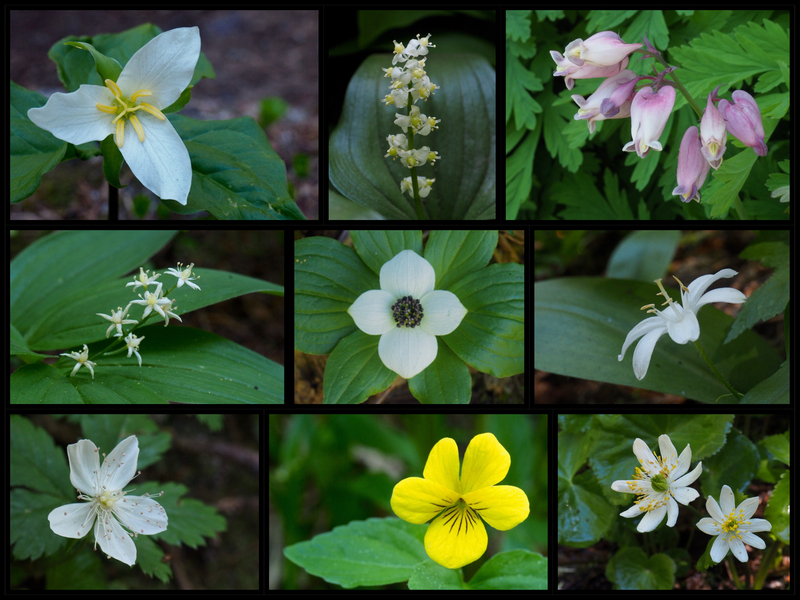 Diminutive and mostly pallid blooms light the early summer woodland shadows, including Pacific trilliums (Trillium ovatum) (upper left), two-leaved false Solomon’s seals (Maianthemum dilatatum) (upper center), Pacific bleeding hearts (Dicentra formosa) (upper right), star-flowered false Solomon’s seals (Maianthemum stellatum) (center left), western bunchberries (Cornus unalaschkensis) (center), queen’s cups (Clintonia uniflora) (center right), five-leaved brambles (Rubus pedatus) (lower left), pioneer violets (Viola glabella) (lower center), and white marsh marigolds (Caltha leptosepala) (lower right). Denny Creek – Melakwa Lake Trail, July 02, 2017. Approximately 1.90 miles/3.10 km from the trailhead, Denny Creek slips over a massive, stony outcrop at Keekwulee Falls. Not surprisingly, “keekwulee” means “to fall down” in the Chinook jargon. Denny Creek – Melakwa Lake Trail, June 22, 2018. From the main trail, a short boot path descends steeply to the pools atop Keekwulee Falls. Denny Creek – Melakwa Lake Trail, July 02, 2017. Above Keekwulee Falls, Denny Creek courses through a narrow, steeply walled canyon. The main trail switchbacks up the canyon’s edge, occasionally approaching within steps of the plunging precipice, where bird’s-eye views open across the treetops below. Denny Creek – Melakwa Lake Trail, August 03, 2014 and September 02, 2013. The forest opens as the trail ascends Denny Creek’s boulder-strewn upper valley just below Hemlock Pass. The lakes Melakwa lie a scant half mile/0.80 km beyond the pass. Denny Creek – Melakwa Lake Trail, July 02, 2017. 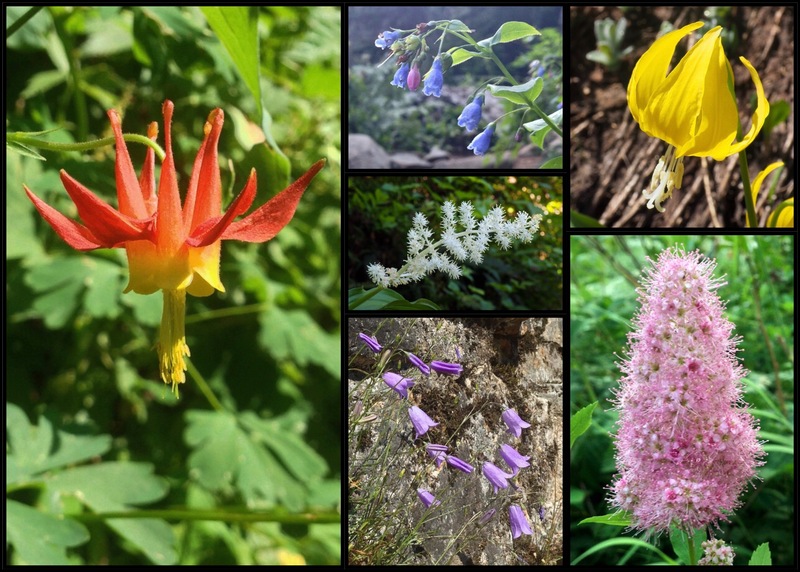 In sunny clearings along the trail, look for more vibrantly hued wildflowers, including western, or, Sitka columbines (Aquilegia formosa) (left), tall bluebells (Mertensia paniculata) (upper center), plumed false Solomon’s seals (Maianthemum recemosum) (center), common harebells (Campanula rotundifolia) (lower center), yellow avalanche-lilies (Erythronium grandiflorum) (upper right), and western spirea, or, hardhack (Spiraea douglasii) (lower right). Denny Creek – Melakwa Lake Trail, August 03, 2014 and July 02, 2017. After attaining Hemlock Pass, the trail enters a pleasant forest and descends small, rolling hills. Just before reaching Melakwa Lake, a side trail leads downhill approximately one mile/1.60 km to Lower Tuscohatchie Lake and, just beyond, Pratt Lake. With transportation arranged between trailheads, the Melakwa, Lower Tuscohatchie, and Pratt lake trails can be hiked as a loop of approximately 10.75 miles/17.30 km. Denny Creek – Melakwa Lake Trail, August 03, 2014. The trail makes lakefall at the logjam over Melakwa Lake’s outlet to the Pratt River. Chair Peak’s bastion anchors the opposite shore. Denny Creek – Melakwa Lake Trail, July 21, 2013. Melakwa Lake pools in the cradle formed by Kaleetan Peak and Chair Peak. (In the Chinook jargon, “kaleetan” means “arrow.”) Upper Melakwa Lake, its sister, lies just beyond the tree-lined straits on Melakwa Lake’s north end. By stones and leaps, the trail crosses the narrow connecting streams and leads left to Upper Melakwa Lake and right to the not-quite-detached “island” at the base of Chair Peak. Denny Creek – Melakwa Lake Trail, July 21, 2013. On Melakwa Lake’s northern end, fjord-like backwaters nearly cleave an island from the base of Chair Peak. Denny Creek – Melakwa Lake Trail, July 21, 2013. 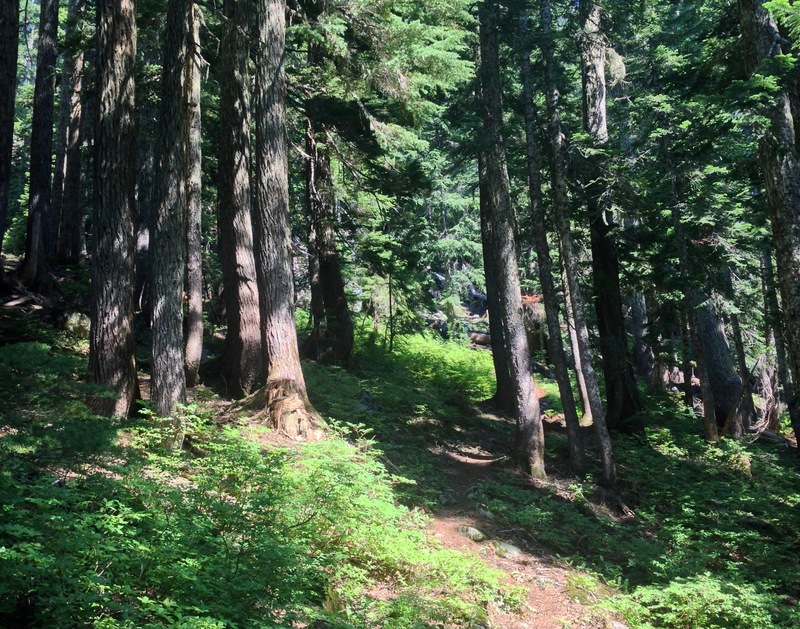 On Melakwa Lake’s “island,” a grove of mountain hemlocks (Tsuga mertensiana) rejoices in the brief summer sun. Denny Creek – Melakwa Lake Trail, July 21, 2013. 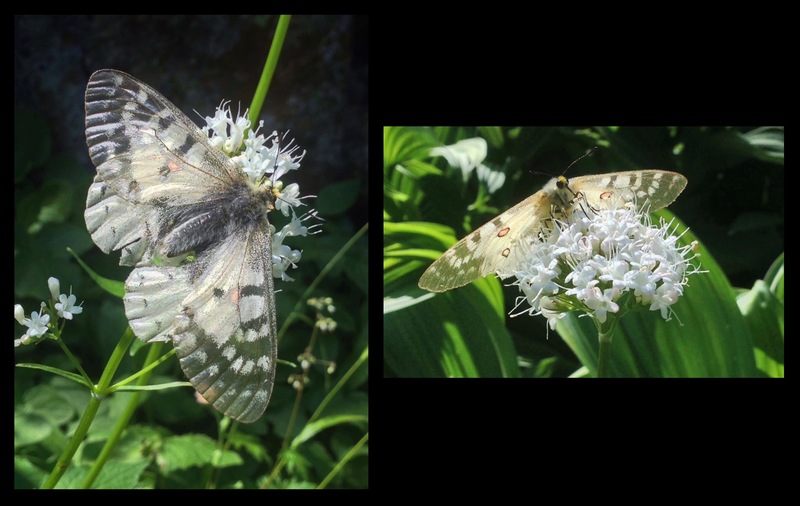 In beds of Sitka valerian (Valeriana sitchensis) along the lake shore, butterflies (here, likely clodius parnassians, Parnassius clodius, also known as clodius Apollos or Apollo parnassians) engage in the frenzied, even if brief, pursuit of nectar and mates. Denny Creek – Melakwa Lake Trail, August 03, 2014. As fragrant as they are vivid, subalpine spirea (Spiraea splendens) sweeten the lakeside. Denny Creek – Melakwa Lake Trail, August 03, 2014. 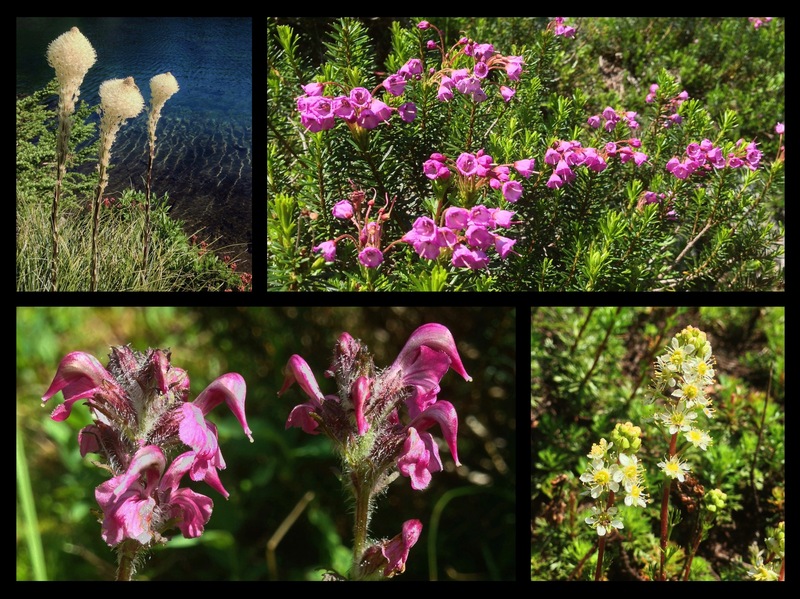 Other blooms bordering the lake include beargrass (Xerophyllum tenax) (top left), drifts of pink mountain-heath (Phyllodoce empetriformis) (top right), bird’s beak lousewort (Pedicularis ornithorhyncha) (lower left), and partridgefoot (Luetkea pectinata) (lower right). 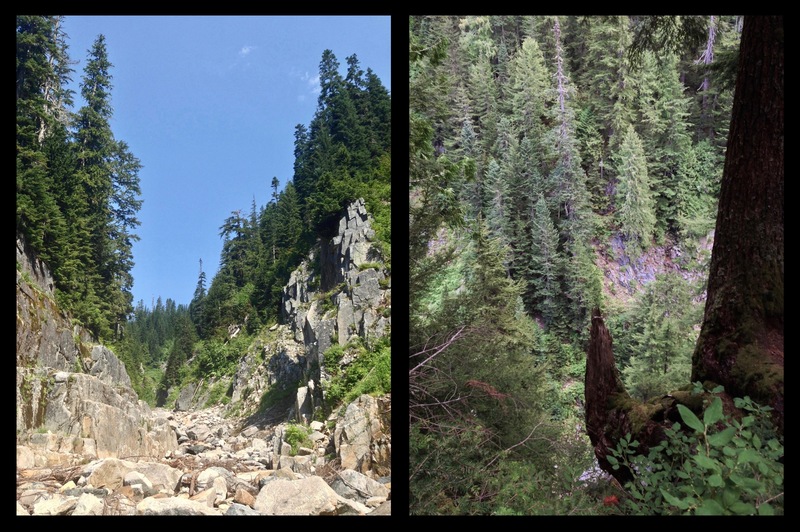 Denny Creek – Melakwa Lake Trail, July 21, 2013 and August 03, 2014. Although, for most, Upper Melakwa Lake’s crystal waters are the final and well-earned destination of an already rigorous hike, intrepid hikers with fortitude and strong ankles can pick their way up the bouldered hollow between Kaleetan Peak and Chair peak for a sweeping view from Melakwa Pass. Denny Creek – Melakwa Lake Trail, July 02, 2017.